Brexit will mean higher taxes, less spending for U.K.
U.K. Treasury chief George Osborne has no doubts: Britain will "absolutely" have to cut spending and raise taxes following its vote to leave the European Union. "It's very clear that the country is going to be poorer as a result of what's happening to the economy," Osborne told the BBC on Tuesday. "We are absolutely going to have to provide fiscal security to people," he said. "In other words, we're going to have to show the country and the world that the government can live within its means." The chancellor of the exchequer said ahead of the vote that an emergency budget would be needed to fill a "black hole" of about £30 billion ($42.6 billion) per year if the U.K. left the EU. Critics dismissed the warning, and accused the Treasury official of running a campaign based on fear. 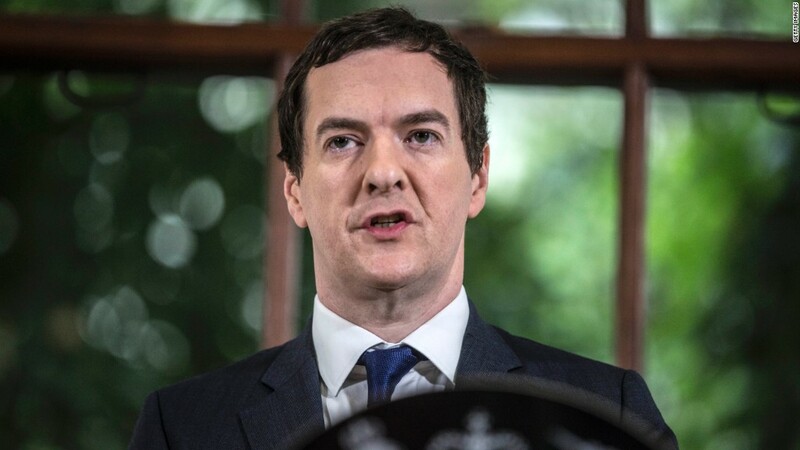 On Tuesday, Osborne said that specific decisions on future austerity would be left to the next prime minister. The chancellor's assessment that more austerity will be needed is the latest body blow to hopes that Britain's economy would be relatively unscathed by a decision to leave the EU. Economists have slashed their growth forecasts for this year, and next, with some even predicting a recession. And on Monday, Standard & Poor's and Fitch Ratings both downgraded the U.K.'s credit rating. The weaker credit rating could make it harder and more expensive for the U.K. to borrow money and finance its debts. The U.K. has the second highest budget deficit in the G7 after Japan, and the highest current account deficit -- that means it has to borrow more from the rest of the world to fund its imports than any other major advanced economy. If investors start pulling money out of the U.K., further pressuring the pound, "this would raise questions over the funding of the U.K.'s large current account deficit ... and more fundamentally over the role of [the pound] as one of the few global reserve currencies," Moody's warned last week. Osborne was once viewed as a possible successor to Prime Minister David Cameron, but he has ruled himself out as a replacement. -- Simon Cullen and Mark Thompson contributed reporting.